Coffee Time: My wife does not work! ARE YOU SURE? H: She doesn't work. She's a housewife. H: My wife takes them to school, because she doesn't work. H: Usually takes a while to figure something out that she can do while she is out, so she doesn't have to pack and unpack the carseat too many times, like drop off bills or to make a stop at the supermarket. Sometimes she forgets something and has to make the trip all over again, baby in tow. Once back home, she has to feed the baby lunch and breastfeed again, get the baby's diaper changed and ready for a nap, sort the kitchen and then will take care of laundry and cleaning of the house. You know, because she doesn't work. H: Rest, of course. Well, I'm tired after working all day in the bank. H: She makes dinner, serves my children and I, washes the dishes, orders once more the house, makes sure the dog is put away as well as any left over dinner. After helping children with HW she gets them prepared to sleep in pajamas and the baby is in fresh diapers, gives warm milk, verifies they brush their teeth. Once in bed she wakes frequently to continue to breastfeed and possibly change a diaper if needed while we rest. Because she doesn't have to get up for work. Whom do you think works more? -This is the daily routine of many women all over the world, it starts in the morning and continues until the wee hours of the night... This is called "doesn't work"?! Enjoy and appreciate your wife, mother, grandma, aunt, sister, daughter... Because their sacrifice is priceless. 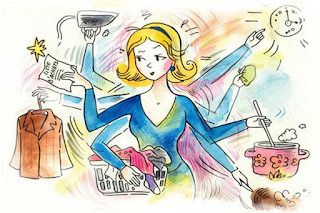 You are a woman who works or is it just "housewife"?? I don't have a licence for disease.
" but what do you do all day?"